Kitties have sensitive noses and dislike harsh deodorizers, especially in their litter boxes. Even with daily scooping and regular washing, your kitty's litter box can become a little stinky, but using harsh deodorizers to cover odors can bother your furry friend. Instead, mix up a cat-safe refresher to spray or sprinkle over the box with when it starts to smell unpleasant between cleanings. Baking soda is non-toxic to our feline friends and works well to eliminate odors. Sprinkle a layer of plain baking soda under your kitty's litter when first filling the box to absorb odors. Add just a dash of baking soda over the top of the litter, or mix it throughout, whenever the box gets a little odorous. To add a touch of scent to the baking soda, place a cup of it in a resealable plastic bag and add 10 drops of essential oil to it. Let the baking soda sit overnight to absorb the essential oil scent before use. Pour it into a grated cheese shaker to sprinkle over the litter, improving its odor. Vinegar helps neutralize odors and has antibacterial properties to kill off odor-causing microorganisms. Not only is this an all-natural, environmentally-friendly cleaner, but it's also safe to use around kitties. Make an odor-fighting spray by mixing one part water with one part white vinegar to spritz over the box when it gets smelly. Add a few drops of essential oil to the spray to give it a pleasant aroma. While the scent of vinegar is a bit strong, it should fade within a few minutes of spraying it over the litter and the box, leaving behind a fresh scent instead. Herbs like lavender, sage, spearmint and lemon-balm all smell fabulous. The herbs are safe to use around kitties because they are non-toxic to them, even if ingested in small amounts. Dry one or more of these herbs and grind them into a fine powder using a food processor. Mix the herb powder with an equal part cornstarch, which helps to absorb odors; sprinkle it over your kitty's smelly litter box. Boil fresh cuttings of your favorite herbs in water for 15 minutes to create a mildly scented liquid. Pour the liquid into a spray bottle to spritz over the litter box, giving it a pleasant scent; strain the herbs out of the liquid before use. 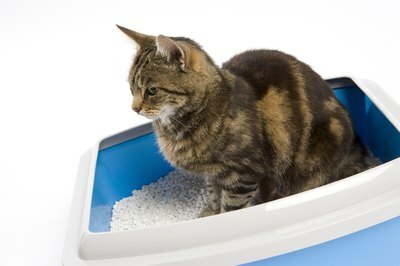 When making a homemade litter box refresher, use only natural, non-toxic ingredients. Avoid using harsh fragrance oils which may not only be toxic to your feline friend but also cause her to avoid the litter box, leading to inappropriate elimination issues. Instead, add small amounts of essential oils, derived from plants to your mixtures to add a pleasant aroma. If you don't have essential oils around, substitute an equal amount of vanilla or peppermint extract instead. Remember, the best way to freshen a litter box isn't using a litter box deodorizer but with a good scrubbing and replacement of the litter.